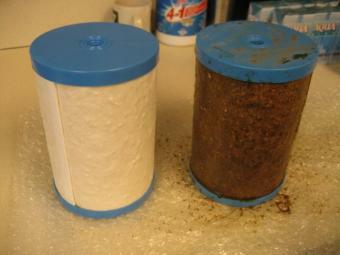 Remember to change your water filter! This picture was taken January. 2010. (A new filter is on the left and a used filter is on the right.) The dirty filter is after one year of use. The customer wanted to use the cartridge for a year. We, of course, suggested – and they agree – it will be replaced more often! The Multi-Pure filter was inside a countertop water cooler in a City of Portland office breakroom in a newer building…amazing! The employees on this particular floor had organized a “water club”. Those who participate chip in to help pay for the water cooler. They were spending $100/month for rental of a cooler and the purchase/delivery of LOTS of 5 gallon bottled water. Those who are not in the water club either buy bottled water or drink from the tap. Needless to say, they are spending MUCH, MUCH less now, with more convenient, better quality water. Three of the employees purchased the cooler and they are renting the filter. I had worked out a rental agreement with them (prior to our new rental program). A “water club” is a great suggestion for offices, etc. Folks can chip in to have great water for less! In the Beaverton Area? If you would like to contact Sue & Scott to have a new bottle-less water cooler or Multi-Pure system installed in your home or office contact them at http://www.multipureusa.com/sueanderson/index2.html or call them direct at 503-644-9768. ← NSF Certifies That Multi-Pure Is THE Most Effective Water Filter! Look at that! Its shows that it works. Sometimes we should think five steps forward to know the advantages of having a filter compared to spending money buying water by gallons.